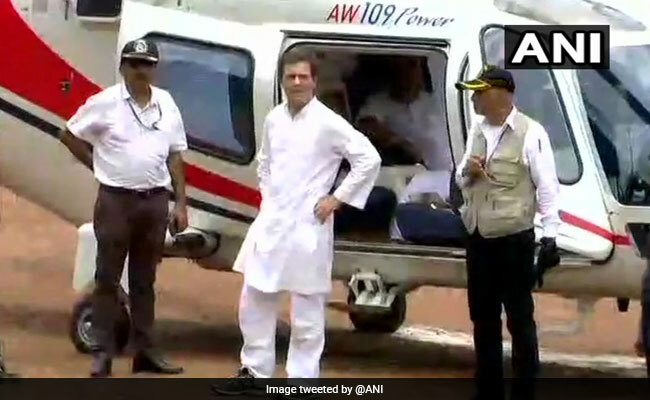 Congress president Rahul Gandhi will take stock of the flood situation in the Wayanad district of Kerala today. Mr Gandhi is on a two-day visit to the flood-hit state. He reached Kerala on Tuesday morning and met people at a relief camp in North Paravur district. He promised people living in the camp that Congress leaders would put pressure on the government for compensation. As Kerala is inching towards normalcy, the Cochin international airport has resumed operations today. The central government will today hold a meeting with heads of banks and insurance firms to review relief and rehabilitation measures undertaken by them in Kerala. The delegation will be led by Minister of State for Finance Pon Radhakrishnan. The Chief Minister's Office informed that the Director of Public Instruction has directed all Deputy Directors of Education to ensure that counselling help is available for the children affected by floods. The Chief Minister's Office has informed that the Cochin International Airport in Kochi, which was shut down due to the flood, has become operational. "Cochin International Airport in Kochi (COK), which was closed due to the floods, has commenced its operations. CM Pinarayi Vijayan congratulated the officials and employees of CIAL on making the airport functional in a short time," the CMO tweeted. "In view of the disruption caused due to severe floods in Kerala, the Central Board of Direct Taxes (CBDT) hereby further extends the ''Due Date'' for furnishing Income Tax Returns from August 31 to September 15 for all income tax assessees in Kerala," the Finance Ministry said in a statement. The Income Tax Department has extended the deadline for filing income tax return by fifteen days for people in Kerala. The next deadline is September 15. The Cochin airport became non-functional since August 14 after the floods devastated Kerala between August 8 and 22. It is estimated that the airport suffered at least Rs 220 crore losses due to its closure. The Cochin international airport will resume operations today. Private carriers Jet Airways and Indigo had on Tuesday said they will restart services which were discontinued from August 14 after the airport was shut due to flooding.